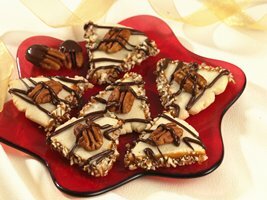 Day 6 of our 12 Days of Cookies is our recipe for Turtle Shortbread Cookies (sometimes called Turtle Bar Cookies or Turtle Cookies). I made these for one of my cookie exchanges over the years and they’ve become one of my all time favorites. Enjoy! In a large bowl, mix butter, sugar and almond extract. Stir in flour and salt. (If dough is crumbly, mix in 1 to Tablespoons additional softened butter). Divide dough into 12 equal parts. Roll each part into a 1/4-inch thick circle. (If dough is sticky, chill about 15 minutes). Cut each circle into 6 wedges. Place wedges 1 inch apart on ungreased cookie sheet. Bake 8 to 10 minutes, or until set. Immediately remove from cookie sheet to a wire rack and let cool completely, about 30 minutes. Once cookies have cooled completely, heat caramels over medium-low heat about 10 minutes, stirring frequently, until melted. In a small microwavable bowl, microwave chocolate chips and shortening uncovered on High 1 to 3 minutes, stirring halfway through heating, until melted and thin enough to drizzle. Dip 2 straight edges of each cookie into melted caramel, then into chopped pecans. (If caramel thickens, add up to 1 teaspoon water and heat over low heat, stirring constantly, until caramel softens). Place a dot of melted chocolate on top of each cookie; place pecan half on chocolate. Drizzle remaining chocolate on tops of cookies.